Latest from Apple !! did u hear that ?? 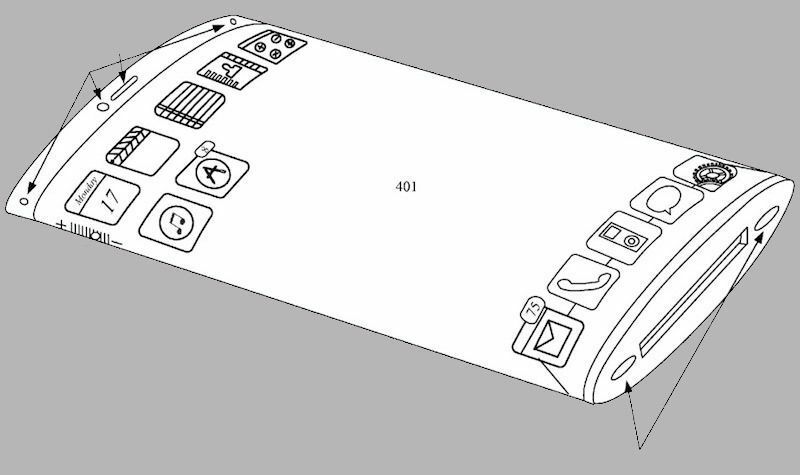 No ..A new patent application from Apple hints at an iPhone with a flexible, wraparound display. So that means two people could watch a videos or view photos on both sides in a continuous loop. This same type of design could also be applied to apple concept iWatch. Apple is seeking a patent for an iPhone that has a display that wraps around the edges of the device, expanding the viewable area and eliminating all physical buttons. In this design, the iPhone’s body could be made of aluminum or a transparent glass with oleo phobic coating to reduce fingerprints. This same type of glass is already used in other electronics and watches. Apple’s patent shows the design with 30-pin connectors because it was developed before Apple released its Lightning connector. If the design does eventually make it to market, it’s a safe bet it will be equipped with the most recent hardware. The company filed for the patent in September 2011, though the application became public only Thursday. Like others, Apple often files for patents on designs that never come to fruition. It also doesn’t comment about future products until it’s ready to launch. Do comment about this latest patent filed from Apple !! My blog has a lot of exclusive content I’ve either created myself or outsourced but it seems a lot of it is popping it up all over the web without my authorization. Do you know any techniques to help stop content from being stolen? I’d certainly appreciate it. Hii, Eloise.. no i am not aware of any such technique but yeah, i don’t think so that people copy your post 100%, in fact if i read some article somewhere, i just make that article into my own words. But if you want , you can take the help of Copy Scrap. The sector hopes for more passionate writers like you who aren’t afraid to mention how they believe. Always follow your heart. great submit, very informative. I ponder why the other specialists of this sector do not notice this. Hello, I think your blog might be having web browser compatibility issues. IE, it has some overlapping issues. I simply wanted to provide you with a quick heads up! I do consider all the ideas you’ve presented to your post. They are very convincing and can definitely work. Still, the posts are very short for novices. Could you please extend them a bit from next time? Thanks for the post.